Has anyone had an extended transom prefabricated at a shop and then welded it on themselves? I've noticed there is a seller on Ebay who fabricates up extended transoms, I assume are intended for inboard to outboard conversions, but he says he can do one up for me, but I found some poor reviews on the web. Anyone have an affordable trusted fabricator who can design and fabricate up an extended transom which also provides flotation and extends a portion of the keel? We are currently sit stern heavy as I have a 115 and 9.9, two batteries and downriggers at the back of the boat, so hope to be able to get more level and put a cooler back on the extended transom. I'm based in BC Canada where there are a shortage of Fabricators, not a shortage of welders :(. 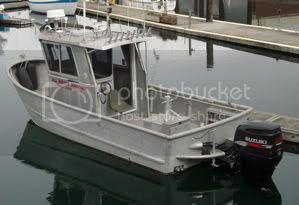 Taking my boat off the island is expensive unless there is a fabricator in the San Juan Islands or Olympic Peninsula. It's easy to import the extended transom. I'm also thinking of putting a small Cuddy on the front of my Hewescraft. Has anyone tried this on smaller aluminum with an existing self-draining bow? I was thinking I could relocate the Livewell to inboard of the transom, where I see Stabicraft has put theirs. I figure having it back their may little bit more convenient than carrying crab and salmon to the front of the boat. I know I should just buy a bigger boat, but the market for used aluminum's is very strong right now, taxes are high and the Canadian dollar is weak. Thanks for any leads on a fabricator and any suggestions.